Tribes Overall: "Costa Rica is a beautiful country. This was our first visit and therefore were uncertain as to exactly what to expect. The variety of experiences resulted in a wonderful holiday." 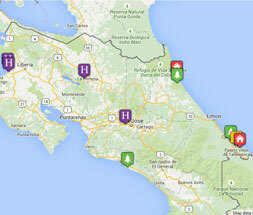 Tribes Service: "The advice regarding our itinerary was tailored to meet our needs as first time visitors to Costa Rica. The choice of accommodation suggested was excellent. Last minute information regarding travel disruption due to road works was appreciated." Guides: "With one exception all the guides were knowledgeable and personable The exception being the guide who took us on a hike over the Lava Flows at Arenal who lacked any personality and gave little information during the whole of the hike. An alternative activity would also be more enjoyable eg. bird watching - sloth trail." Social & Environmental Responsibility: "Difficulty to say." Lovely location, excellent room, quiet. Nice pool area and gardens. Buffet style meals were adequate. Staff helpful and friendly. Lovely location right on the beach. Lots of eating places that are easily accessible from the hotel. Staff very accommodating. An ideal place to relax after travelling around. Clean, comfortable hotel but somewhat chaotic arrangements for hot drinks etc. prior to early morning start. "We were lucky enough to see Arenal volcano bathed in sunshine on one day. Ginger plants and Heliconia growing almost everywhere all added to our experiences of the colourful nature of Costa Rica. Snorkelling in the Pacific ,seeing Reef Sharks ,rounded off a wonderful under water adventure."